Brand the A5 Pickering Folder with your business logo and make sure you're company is seen in meetings, offices and on walks around the city. This PU folder is padded with edge trim. 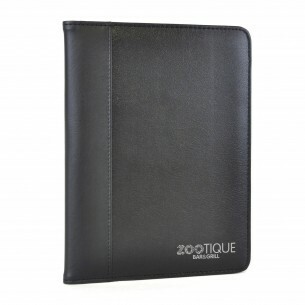 This item comprises of a document holder, business card holder, elasticated pen loop and a 25 sheet notepad. Ideal for corporate businesses to give away to a select amount of customers. We can print up to four spot colours to the printable area of 185 x 100mm. Low minimum order quantity of just 25 units.